Sydney has finally made her decision and has chosen to be with Adrian despite the risk to them both. She has been part of The Alchemists for her entire life, and they absolutely forbid any kind of relationship with Moroi. However, once Sydney realized that the life of an Alchemist may not necessarily be what she wants, she decided to be with Adrian in secret. This is only made harder for her when her sister Zoe shows up, determined to prove what a good Alchemist she can be and pretty much attaching herself to Sydney’s side. Sydney starts to lead a double life–one in which she is the perfect Alchemist, and the other in which she is in love with a vampire. I was so excited to read this book because the ending of The Indigo Spell was such a shocker. Finally, Sydney admits to her feelings for Adrian and they decide to be together and then Zoe shows up! And then when I heard that this book would also feature Adrian’s point of view I couldn’t wait to read it–he’s been one of my favorite characters since Vampire Academy. I’ll admit the book started off a bit slow for me, but it definitely picked up towards the middle. I was worried that once Adrian and Sydney were together things would get dull, but Mead did a great job of making sure that didn’t happen. They had plenty of things going on that caused conflict, so it was very hard for their relationship to get boring. They constantly have to hide what is really going on, even from their closest friends, which made it very difficult for them both. I loved getting Adrian’s perspective in this one. He is such a complex character and I feel like getting his point of view made it easier to understand him a bit more, especially where spirit is concerned. He always comes off as a drunk, but after he stopped drinking in this book it was obvious that the spirit really affects him and numbing himself to it is the only way for him to feel better. Adrian grew a lot in this book, both because of Sydney and because he was able to finally have some confidence in himself. The ending to this book was even crazier than the last! I definitely did not see it coming, and I don’t know how I will be able to wait for the next book. Overall, The Fiery Heart was a great addition to the Bloodlines series. There was a lot of character growth and an ending that will definitely change things for both Sydney and Adrian. I can’t wait to read what happens next! 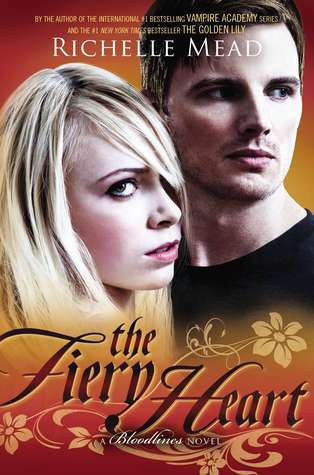 The Fiery Heart was released on November 19, 2013 and is the fourth book in the Bloodlines series. The fifth book, Silver Shadows is set to be released on July 29, 2014.